Massachusetts has been at the forefront of American history for well over 250 years. The Pilgrims came ashore in 1620, and Massachusetts became the site of the first Thanksgiving in the fall of 1621. In the 1700's, as the economy of the area benefited from abundant fishing, trading, and shipbuilding, the residents became increasingly rebellious against Britain's persistent taxation. In 1773, history was made when Bostonians had their famous Tea Party, boarding a British tea ship, and tossing the tea into Boston Harbor in protest of unfair taxation. As skirmishes with the British became earnest battles of the Revolution, the spirit of the patriots swept the countryside, and when the British were forced out of Boston in 1776, the Americans knew the tides were turning in their favor. Massachusetts gained statehood in 1788, and has sent four of her own and one adopted son to become President of the United States: John F. Kennedy, John Adams, John Quincy Adams and George Herbert Walker Bush . Though born in Vermont, Calvin Coolidge served as Governor of Massachusetts from 1919-1921 and went on to be elected President of the United States in 1924. One of our visitors pointed out to us that all of the four Massachusetts presidents were born in the same county - Norfolk County, the County of Presidents. This state was named after the Massachusetts Indians that lived in the Massachusetts Bay Region. Massachusetts means "large hill place." 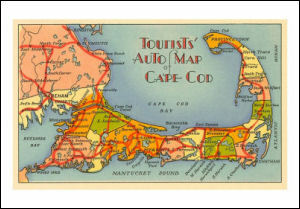 Massachusetts is most commonly known as "The Bay State" or "The Old Bay State" in reference to the Cape Cod Bay where early settlements were made and to the Massachusetts Bay Company given a royal charter in 1629 to promote settlement of the new land "from sea to shining sea." The charter of the Massachusetts Bay Company was the foundation of a government for the Massachusetts Bay Colony. The Puritans served brown bread and baked beans on Sundays because they could be prepared on Saturday. From this practice came the nickname, "The Baked Bean State." Boston has become famous for its baked beans. This nickname applied to the early settlements of the Plymouth Colony in the years 1620-1628, before the Massachusetts Bay Colony was established. This nickname references the settlement of the Pilgrims in Massachusetts and the establishment of the Plymouth Colony. The Pilgrims set up a government in Massachusetts with the "Mayflower Compact." In 1621, the first Thanksgiving was held. In another reference to early colonization, Massachusetts has been called "The Puritan State" because of the Puritan emigrants who arrived in Massachusetts looking for a place to practice their religion where they would not be subject to persecution. People who live in Massachusetts or who come from Massachusetts are called Bay Staters after one of the state's nicknames. This designation was made Official by the legislature December 18, 1990. Four men, born in the Commonwealth of Massachussetss, attained the office of President of the United States. John Fitzgerald Kennedy: John Kennedy was born in Brookline, Massachusetts on May 29, 1917. He served as the 35th President of the United States between Dwight Eisenhower and Lyndon Johnson. His term was cut short by assasination on November 22, 1963 in Dallas, Texas. Lyndon Baines Johnson became the 36th President of the United States when he was sworn in to complete Kennedy's term in office. George Herbert Walker Bush: George Herbert Walker Bush was born in Milton, Massachusetts on June 12, 1924. He served as the 41st President of the United States and became a member of a small club (2 members, both from Mass.) when his son, George Walker Bush, was elected to be the 43rd President of the United States in 1999. George Herbert Walker Bush was often referred to as "Poppy" or "Bush41." The Massachusetts State Quarter is the first commemorative quarter of the new millennium and displays the only design to date determined by the children of the state. The "Minuteman" statue stands in tribute to the regular farmers and colonists that were prepared to drop everything at a moment's notice to take arms against the British. Massachusetts (From Sea to Shining Sea) , by Joan Leotta. 80 pages. Publisher: Children's Press(CT) (December 2001) Reading level: Grades 3-5. 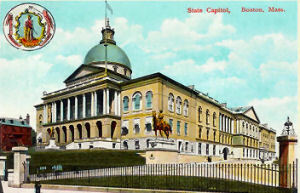 Presents information about Massachusetts's people, geography, history, landmarks, natural resources, government, state capitol, towns and cities, and more. Massachusetts (World Almanac Library of the States) , by Rachel Barenblat. 48 pages. Gareth Stevens Publishing (December 2001) Reading level: Grades 4-6. Filled with the most up-to-date information, including the latest Census results. Full-color photos bring to life the story of Massachusetts. In addition to an in-depth factual profile of Massachusetts in the form of a state Almanac, this book offers fascinating and lively discussions of the state's history, people, geography, government, economy, culture, and lifestyles. A section on Notable People, a calendar of events, and enough primary source documents, time lines, maps, and other tools to make this unquestionably the best young adult reference material on the USA available anywhere. Massachusetts: A Concise History , by Richard D. Brown and Jack Tager. 361 pages. Publisher: University of Massachusetts Press; Rev Exp edition (October 2000) In this book, Richard D. Brown and Jack Tager survey the rich heritage of this distinctive, and distinctly American, place, showing how it has long exerted an influence disproportionate to its size. A seedbed of revolt against British colonial rule, Massachusetts has supplied the nation with a long line of political leaders-from Samuel and John Adams to William Lloyd Garrison and Lucy Stone to John, Robert, and Edward Kennedy. Its early textile mills helped shape the industrial revolution, while its experiences with urbanization, immigration, ethnic conflict, and labor strife reflected the growth of the national economy. In the twentieth century, the state continued to lead the country through a series of wrenching economic changes as it moved from the production of goods to the provision of services, eventually becoming a center of the high-tech revolution in telecommunications.